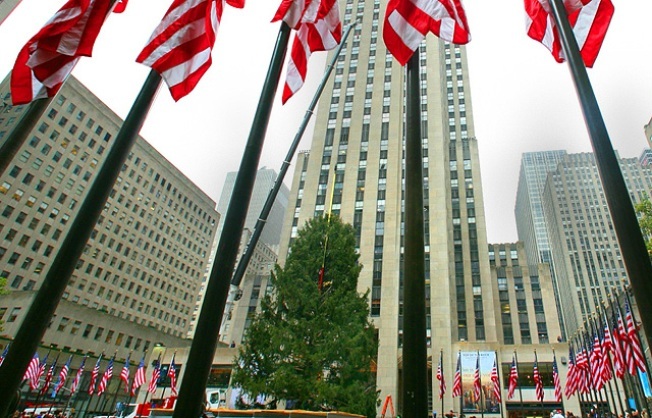 NBC's headquarters at Rockefeller Center in Manhattan. NBC said on the eve of Sunday's Super Bowl that it has sold the last two of the 69 advertising spots for the game, pushing total ad revenue for the event to a record $206 million. The network said its total of $261 million in ad revenue for all of Super Bowl day also is a record, calling it an especially impressive feat in the middle of the economy's steep downturn. The Super Bowl is the premier advertising event with an U.S. audience of 100 million viewers, many of whom watch closely during game breaks for the debut of entertaining, big-budget commercials. The ads have sold for between $2.4 million and $3 million per 30-second slot this year. "These advertising milestones show the power of the NFL brand and the strength of the Super Bowl as a TV property in this economic climate," said Jeff Zucker, president and CEO of NBC Universal, a unit of General Electric Co. "The Super Bowl has become one of our country's biggest holidays, a uniquely American day, and advertisers recognized the value in being a part of it." Thirty-two advertisers in all will showcase their products during Super Bowl coverage. NBC said the ads featured during the game also will be available for viewing almost immediately after they air at Web sites including NBC.com, Hulu.com and Superbowl.com.